Campaign for Trade Union Freedom	» CTUF At Tolpuddle – This Weekend! 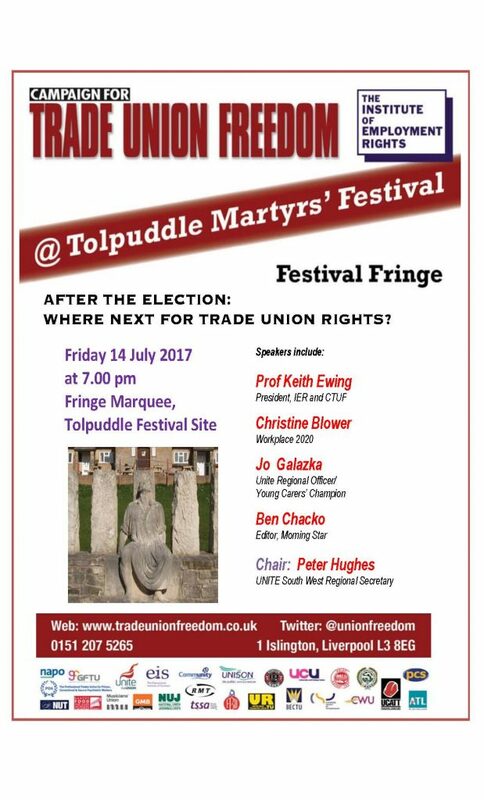 CTUF At Tolpuddle – This Weekend! The CTUF/IER fringe will take place again this coming weekend on Friday evening at the Tolpuddle Martyrs’ Festival. Speakers awill include Prof Keith Ewing IER/CTUF; Christine Blower Workplace 2020; Jo Galazka Unite Regional Officer; and, Ben Chacko, Editor of the Morning Star. This entry was posted in Campaign For Trade Union Freedom News, European Employment Rights, International Employment Rights, UK Employment Rights. Bookmark the permalink.